We are getting out of the business after a dozen years breeding Welsh. In doing so, we have slashed the prices of all our sale ponies and added ponies to the sales list we never thought we would ever sell. Our loss is your gain! We often have youngstock for sale and occasionally have ponies already with training. 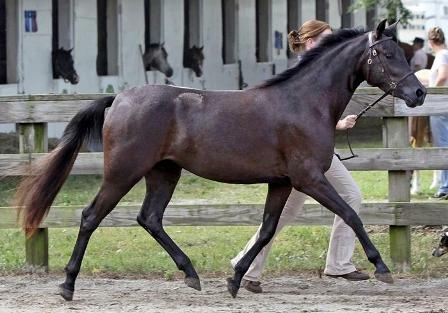 We do encourage sales of youngsters at affordable prices which allows their new owner to begin training. Our young ponies do undergo much training even before they begin under saddle. As weanlings, they learn to stand for the vet and farrier and even begin to learn about being loosely tied for grooming. 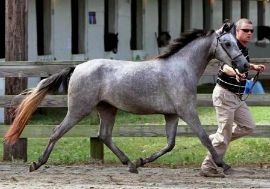 As yearlings, they go to the trainer's barn to learn what it is like to be around the hustle and bustle of a show barn. They begin working in a round pen and even start wearing a bit at this time. As two year olds, they are introduced to the saddle and learn about lining. Our youngstock is not broken under saddle until the winter of their third year, when they are coming four year olds. This gives them plenty of time to grow and learn all the ground manners needed to be a child's pony. All of our ponies are up to date on vaccines (EWT, West Nile, Potomac and Rabies), farrier work and deworming. All of the ponies have been microchipped to be able to maintain a positive ID on each individual.